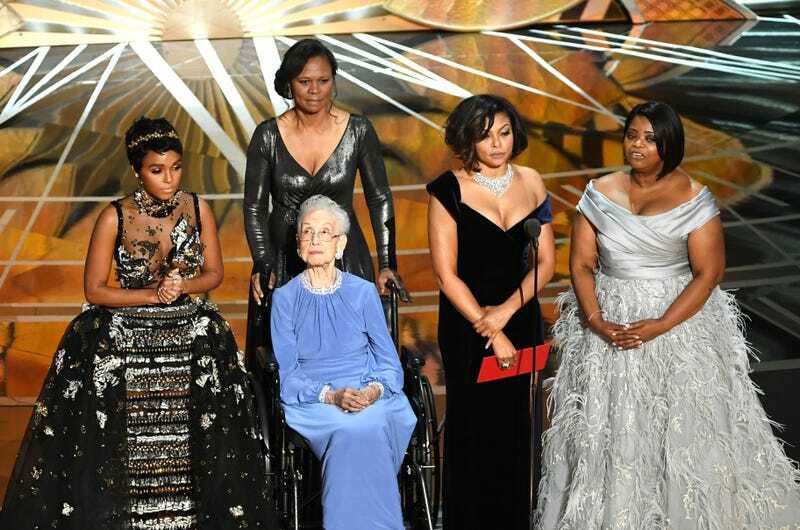 NASA mathematician Katherine Johnson (seated) appears onstage with actresses Janelle Monáe (left), Taraji P. Henson (second from right) and Octavia Spencer (right) during the 89th Annual Academy Awards at Hollywood & Highland Center on Feb. 26, 2017, in Hollywood, Calif.
Taraji P. Henson portrayed NASA mathematician Katherine Johnson in Hidden Figures and brought her story to life. And on the eve of the famed mathematician’s 100th birthday, Johnson’s alma mater, West Virginia State University, will honor her with a bronze statue and a scholarship in her name. According to the Register-Herald, the $100,000 scholarship will be awarded to underrepresented students majoring in STEM fields. The statue, which was created by West Virginia sculptor Frederick Hightower, also an alum of WVSU, will be unveiled Aug. 25.